Wine is born of the earth, and we are merely its keepers. By choosing to cultivate the autochthonous vines of these hillsides, we strive to return to our very own roots, to look towards the future without betraying the past. We get to know our vineyards by walking up and down between the rows. We know how to govern the vines by seconding their very nature. With patience and trust, we follow the rhythms of the seasons, awaiting the ripened fruits of our labours. We respect its inner nature, without forcing it. We refuse to compromise its uniqueness for an impossible ideal, but rather seek to gather its spontaneity. To rediscover the land through our wines and ourselves in this land. Casa Cecchin stands on a panoramic terrace overlooking some of the loveliest vineyards in the Vicenza area, open to the sunlight and updrafts that make its microclimate unique. 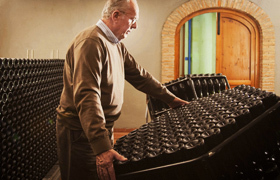 In 1973, Renato Cecchin decided to embark on the venture of winemaking with just one idea in mind: to give a voice to the excellence of this territory. For this reason he chose to plant Garganega and, above all, Durella grapes. Durella is an autochthonous variety of the Lessini Mountains, now sought after worldwide, that at the time was risking abandonment. Durello wine was once considered rustic and sharp, but Renato realised that it required only more attention to reach its full potential. The year 1978 was the first year of production for this new Durello. The vibrant acidity of this autochthonous variety urged him to attempt re-fermentation in a bottle according to the Classic Method. Hence the birth of the Durello Spumante in 1988, destined to become the hallmark of the company. 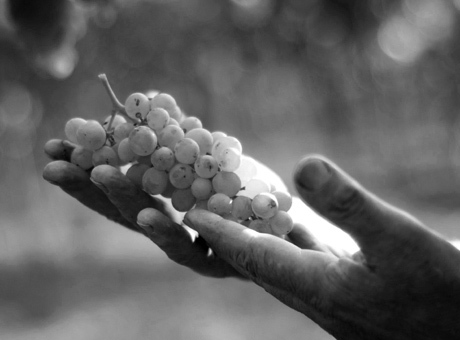 These are wines that we continue to make today, but with forty years more experience. 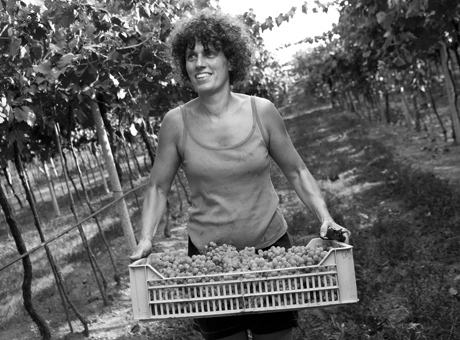 This is the story of how Casa Cecchin was founded and continues to inspire us today in making our choices. The Lessini Mountains and the hills of Gambellara speak of their age-old volcanic origins through their bubbling crests and the iridescent hues of the soils. The story of these "forgotten volcanoes" is absolutely unique: in fact, they are "lands of fire" born of the water and moulded over the ages by atmospheric elements. 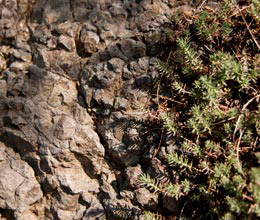 A unique geological mosaic, the mineral complexity of which translates into wines with rich and vibrant personalities that continue to unfold over time. These volcanic soils leave a profound imprint on the wines that originate here. Especially white wines like Durello and Gambellara. The tophus, the basalts, and other products of the volcanic eruptions are in fact rich in iron, aluminium, potassium, manganese, and other oxides and microelements that are rarely found in other soils. These are what determine the mineral characteristics, the dynamic flavour and the longevity of the volcanic white wines. The history of the Lessini Mountains began about 35 million years ago, when enormous bubbles of rising magma began to corrugate the bottom of an ancient sea, giving rise to intense volcanic activity. Over millions of years, the atmospheric elements profoundly transformed the structure of these lands, creating a minerality that was particularly bioavailable for the vines. The result is a mosaic of red-violet tophaceous marlstone, active limestones, and basaltic skeletons. The former give Durello and Gambellara their structure and complexity, while the latter add dynamism and elegance. 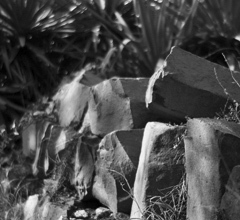 Around Casa Cecchin, the land narrates the volcanic history of the Lessini Mountains. 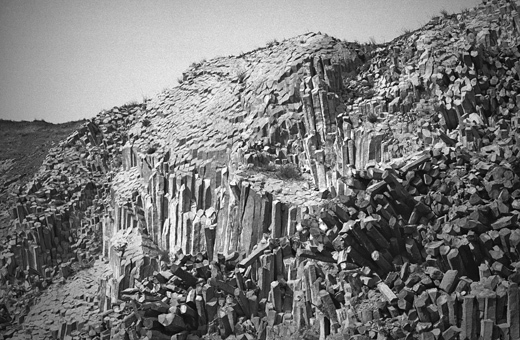 One of the most impressive manifestations are the columnar basalt of Gambellara. These majestic hexagonal crystals of black rock arranged vertically like organ pipes are all that remains of the ancient ducts of magma that then underwent quick cooling during underwater eruptions. The Basalt Quarry of Gambellara. A 1950 photo courtesy of Mario Zonin. The Lessini Mountains, a land of ancient volcanoes, stretch into the heart of Veneto between the provinces of Verona and Vicenza. 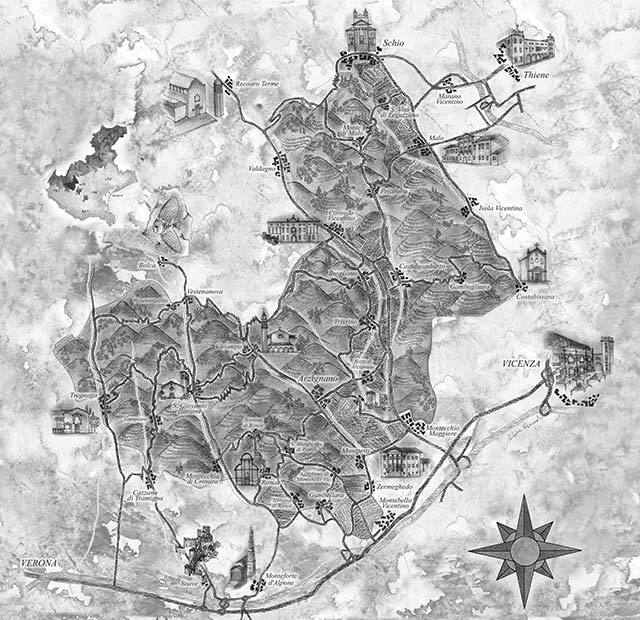 The zone where Durello is produced covers about twenty towns overlooking the valleys of d'Alpone, Illasi, and Tramigna towards Verona and those of Chiampo, Agno and Leogra towards Vicenza. 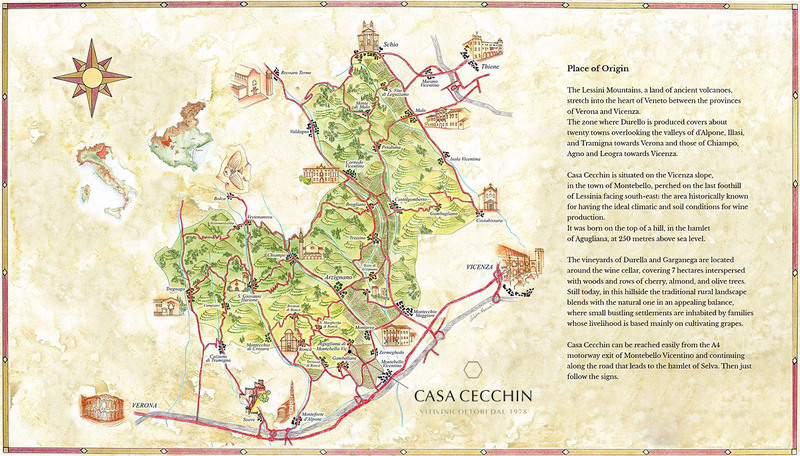 Casa Cecchin is situated on the Vicenza slope, in the town of Montebello, perched on the last foothill of Lessinia facing south-east: the area historically known for having the ideal climatic and soil conditions for wine production. It was born on the top of a hill, in the hamlet of Agugliana, at 250 metres above sea level. 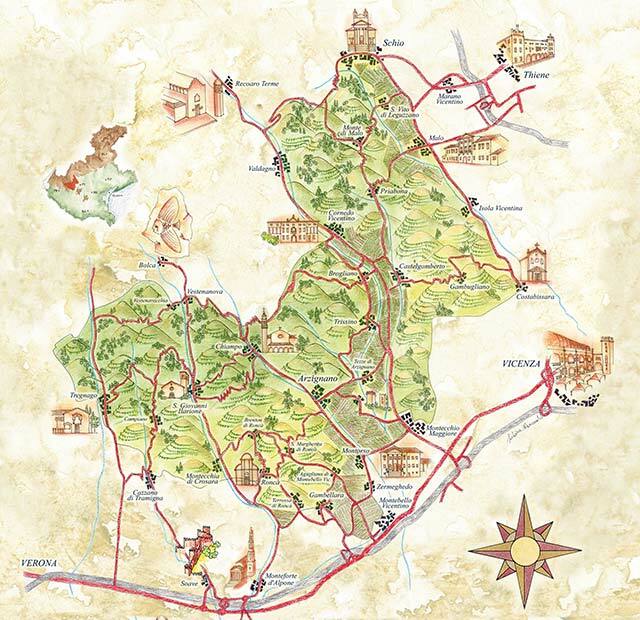 The vineyards of Durella and Garganega are located around the wine cellar, covering 7 hectares interspersed with woods and rows of cherry, almond, and olive trees. Still today, in this hillside the traditional rural landscape blends with the natural one in an appealing balance, where small bustling settlements are inhabited by families whose livelihood is based mainly on cultivating grapes. 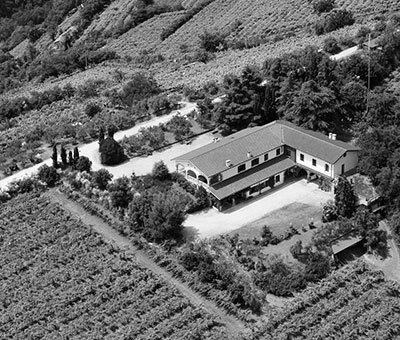 Casa Cecchin can be reached easily from the A4 motorway exit of Montebello Vicentino and continuing along the road that leads to the hamlet of Selva. Then just follow the signs. In Casa Cecchin, we are particularly fond of the Durella vines. It is in fact thanks to the headstrong Renato that this vine was saved from what would have been an unjust oblivion. In rural tradition, in fact, these grapes made for wines that were sour - or "rabiosi" (angry) - according to the local dialect. Yet this age-old grape, which was virtually unknown outside of Lessinia, concealed a potential for excellence just waiting to be discovered. All that was needed was a bit more coaxing to obtain a dynamic white wine of refreshing crispness, rustic but also seductive, even for the most demanding palates. A journey to Champagne led to the insight that its vibrant acidity was the base for an autochthonous spumante, a Classic Method actually linked to its territory. Durella grapes gave rise to our Classic Method Riserva spumante, the still Durello that we have been producing since 1978, Pietralava - another still wine with more body from a late harvest, Mandégolo – a sur lie with slight re-fermentation in the bottle, and the passito Il Montebello, the perfect balance of acidity and sweetness. All of them have the brand name Doc Lessini Durello and Monti Lessini. 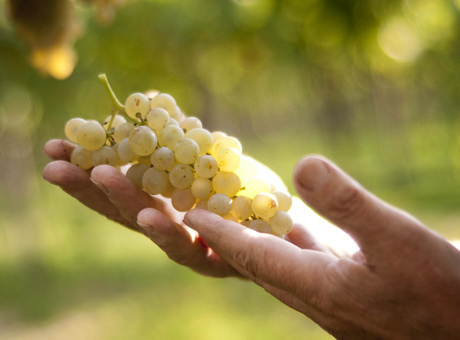 Garganega is a white grape most commonly found between Lake Garda and the Euganei Hills. Curiously, its offsprings tend to take their names from the territory where they were born: Custoza in Custoza, Soave in Soave, Gambellara in Gambellara. Tradition dictates this variety's capacity to absorb the precise "colours” of the territory, the subtleties of a hillside, the genius loci of a vineyard. But like any genius, they require education to fulfil their potential. The generosity of this species of grape would bring it in fact to disperse this essence in kilos and kilos of grapes (somewhat frequently with disappointing results, above all in the past). Instead, it should be contained, but not to the point of clipping its wings. And then wait: for the roots to push beyond the surface layer, for the wine to evolve without constraints. Our Garganega grapes give rise to San Nicolò Gambellara classic, reflecting all the freshness of the fruit, La Guarda – a superior Gambellara conceived to evolve over time, and Le Ginestre, Recioto di Gambellara from dried grapes as tradition dictates. All these wines have the Doc Gambellara brand name, with the exception of Recioto, DOCG. The charm of the Classic Method is born of its double life. The first is similar to that of any other wine, obtained from grapes cultivated expressly to exalt their natural acidity. 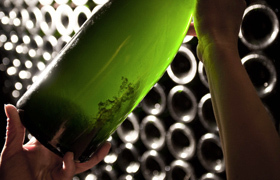 Its second life begins instead in the bottle, where yeasts and sugars are added to trigger a second fermentation. The living microorganisms feed on the sugar, producing carbon dioxide that, as it cannot escape from the bottle, remains trapped in the wine, giving it its perlage. When the nourishment is depleted, the yeasts deposit on the bottom in the form of residue. Then a process called “autolysis” occurs, meaning that the yeasts restore what they removed from the wine back to the wine. However, it has been transformed. Over the years, this exchange determines the unmistakable aromatic profile of our Lessini Durello Classic Method. With disgorging, the lees are eliminated, leaving a perfectly limpid wine. 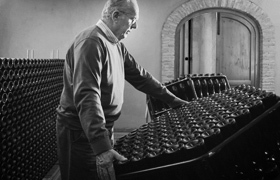 Renato Cecchin, a talented engineer, patented a system to facilitate the remuàge – or riddling - of the Classic Method (the rotation of the bottle that brings the yeasts to the top before disgorging). 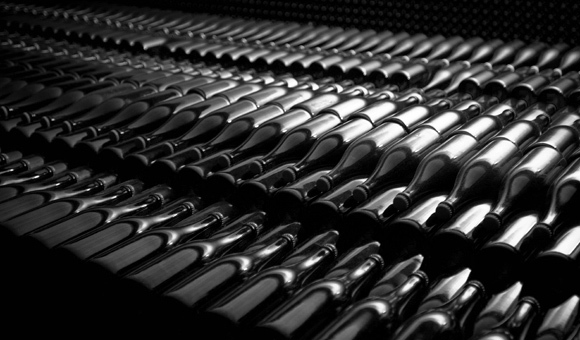 Traditionally, this operation was done by hand, two bottles at a time, on the typical hand riddling racks. But thanks to the hexagonal “basket” he invented, it is now possible to manually rotate 273 bottles with one simple gesture. This wine highlights the enormous potential of durello grapes for the sparkling process with the Classic Method. The hallmark of our company,produced during our best years. Five years of remaining on the yeastsleave a significant olfactory impact and complexity. The most authentic version of Durello.Here we find the verticality of the grape variety and the mineral structure of our soils. Traditional sur lie,slightly sparkling.Mandégolo is the name of a small stream that runs near the wine cellar. Thi is the name chosen for our most recent product, which revives a rural tradition of yesteryear. The typical cripness of Durello wine marries the sweetness of this extraordinary passito. Its uniqueness is due to the malic acid typical of this variety of grapes. The olive trees are positioned amidst the vineyards and in the headlands on corporate estates. Grignano is the name of the dominant variety.Its oil is known for its intense aroma and spiciness. b) fornire, previo suo espresso consenso, informazioni commerciali e/o promozionali nonché inviare materiale pubblicitario su prodotti, servizi ed altre attività di Casa Cecchin. I suoi dati personali potranno essere comunicati a terzi per adempiere ad obblighi di legge, ovvero per rispettare ordini provenienti da pubbliche autorità ovvero per esercitare un diritto in sede giudiziaria. Inoltre, previo suo consenso, i suoi dati potranno essere comunicati anche alla Rete di vendita di Casa Cecchin, che li tratterà per finalità connesse alla promozione dei rispettivi prodotti e servizi. Letta l'informativa: Acconsento Affinché i miei dati vengano trattati da Casa Cecchin, dalla sua Rete di Vendita cui i medesimi potranno essere comunicati per le finalità di cui al punto b) e con le modalità di trattamento ivi previste, incluse le comunicazioni elettroniche (posta elettronica, sms etc).